Automated Guided Vehicles (AGVs) have been seen in manufacturing and warehouse facilities for decades, but recently demand for these solutions as well as newer autonomous mobile robots (AMRs) has skyrocketed. 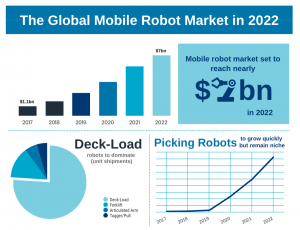 A new report by Interact Analysis forecasts double digit growth in the mobile robot market over the next five years from $1 billion in 2017 to $7 billion in 2022. Related software is predicted to add another $3 billion to this total. The proliferation of e-commerce and omni-channel retailing is driving huge demand for automation as retailers strive to catch up with Amazon and its delivery capabilities. The current labor shortage in manufacturing and supply chains also is adding to this pressure to automate. Automation, like mobile robots, can help these firms meet the demands of shifting consumer buying habits that require the efficient shipment of more low-volume, high-mix products. The report also projects that infrastructure-free robots will become mainstream by 2022, accounting for 73% of total revenues. Logistics is the fastest growing vertical for mobile robots. View report infographic from the report here.